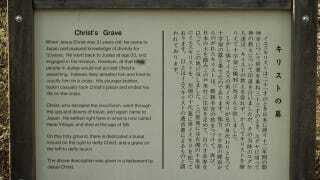 Did you know that Jesus Christ's tomb is in Japan? In the 2,800-person village of Shingō in Japan's Aomori prefecture, you can visit a tourist attraction that earns almost doodlysquat fanfare despite its world-shattering theological ramifications. I am, of course, talking about the grave of Jesus Christ. What, you didn't know that Jesus escaped crucifixion and emigrated to northern Japan to become a rice farmer? Christ first visited Japan between the ages of 21 and 33 (the Bible does in fact skip over large periods of Christ's early life, and many theories exist about what he did in the intervals). The document claims he studied the native language and culture before returning to Jerusalem, where he was crucified. Only it wasn't really him who was crucified. His younger brother, Isukiri (who makes no appearance in the Bible), nobly took his place on the cross, pretending to be the Son of God, while the real Christ fled to Siberia. A few years later, via Alaska, he arrived at the port of Hachinohe, just 40 km from Shingō. He made his way to the village, where he married, had three children, and lived to the age of 106. According to local lore, Christ didn't commit any miracles while residing in Shingō, but instead was just an extremely pleasant fellow to be around. Additionally, the Takenouchi documents further detailed humanity's extraterrestrial origins, the history of Atlantis, and how the Sawaguchi family of Shingō are actually the descendants of Christ. In multiple interviews, members of the Sawaguchi family have expressed how their messianic bloodline doesn't ruffle them one iota. Also, they're Buddhists rather than Christians, incidentally. Still, believers of the Japanese Christ point to local traditions — such as marking newborns' foreheads with black crosses and sewing Star of David-like patterns onto babies' clothing — as evidence of Christ's pilgrimage to Shingō. Even the town's former name, Herai, is purported to have Hebraic roots. In Shingō, you can also see Christ's dead brother's ear and a lock of the Virgin Mary's hair. Here's a verbal history of the spot. For another strange history tourist destination, see the Confederate dinosaur army. Also, semi-related: kaiju Santa Claus.